Removable Ornamental Bollard Post Barrier. Provide an attractive yet functional barrier to vehicle access and parking. 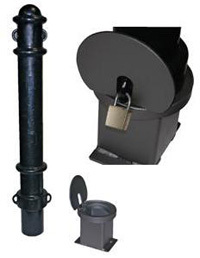 Bollard locks into galvanized steel socket that is cemented into the ground. When the bollard is removed, a socket cover protects the hole, leaving no protrusion above the surface. Padlock not included. Powder coat black finish. Includes eyes for attaching chain or rope. ER-BOL-40-BK Underground 40" 4 1/2"
ER-BOL-40-BK-SM Surface 46 3/4" 4 1/2"